Konrad Zuse was born on the 22nd of June 1910 in Berlin. Konrad lived with his father, Emil Wilhelm Albert Zuse(a Prussian postal officer), his mother, Maria Crohn Zuse and his older sister Lieselotte. Two years later the Zuse family moved to Braunsberg. Konrad attended school in Braunsberg. From an early age Konrad was discovered to have an exceptional talent in painting and later on in construction. In 1923 Konrad's father got transferred to Hoyerswerda. Konrad attended a Realschule which allowed him to carry on studying in one of the technical universities after graduation. In 1928 Konrad graduated from Reform-Realgymnasium(secondary school) and applied to a technical school. The Zuse family eventually moved back to Berlin where Konrad enrolled at the Technische Hochschule Charlottenburg (renamed Technical University of Berlin after World War II). Konrad started studying mechanical engineering, he changed to architecture, then thought of becoming a commercial graphic designer, and finally settled for civil engineering. As a student he won many prizes for his constructions, he was very proud of that so he would show them off on every occasion possible. In 1935 he graduated from Technische Hochschule Charlottenburg and began working for Henschel Flugzeugwerke as a stress analyzer for airplanes. Konrad resigned in less than a year for the reason he wanted to start his own company. Konrad wanted to create automatic calculating machines. Konrad's employement with Henschel provided to be very important as his company Konrad's position to be in the army as he was highly needed as an engineer instead. Konrad Zuse began to build his machine by gaining funds from his parents and help from his friends at university by working for him. Konrad's first machine was the V1 (Versuchsmodell ) meaning 'experimental model 1'. Konrad was essentially building his machines from scratch on his own. 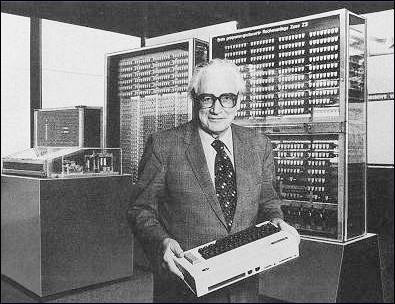 Konrad Zuse's hard work, persistence and determination payed off as he was the inventor of the first programmable computer.